Members of the National Associaton of Latino Elected Officials (NALEO) pose for photos during the annual NALEO Convention. DALLAS — The fight against Texas Senate Bill four escalated to the national stage this week when hundreds of Latino elected officials from across the U.S. stepped up to help repeal the controversial law, and while President Trump’s administration joined the fight. 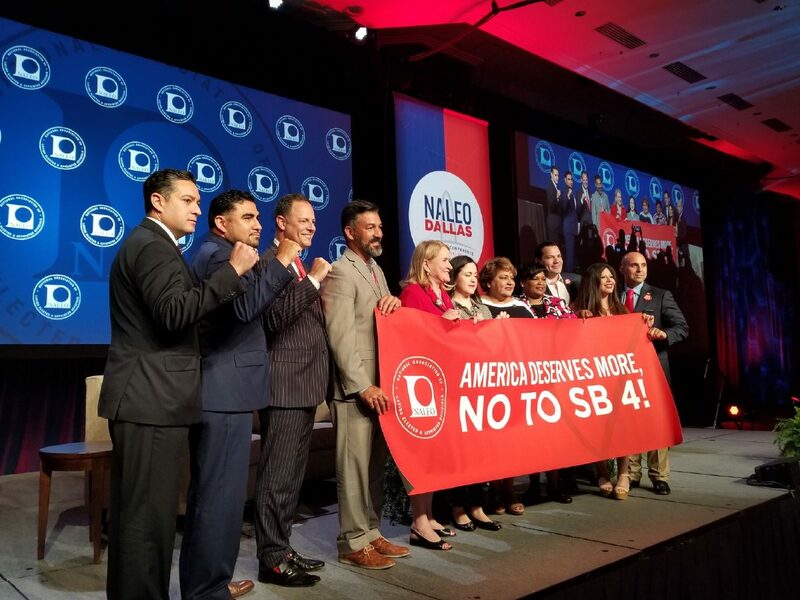 Most of this year’s convention of the National Association of Latino Elected Officials (NALEO) focused on SB4, which many of its critics refer to as the, “show me you papers law.” SB4 was passed during the last legislative session and goes into effect Sept. 1. On Thursday in Dallas, hundreds of NALEO members adopted a resolution condemning SB4 and shared strategies to combat it. NALEO is a non-partisan leadership organization of the nation’s more than 6,100 Latino elected and appointed officials. Nearly 1,000 of them attended this year’s conference. SB4 prohibits localities in Texas from implementing or maintaining policies that prevent local officials from sharing immigration-related information with the federal government. Additionally, SB4 directs local officials in Texas to cooperate with immigration detainer requests issued by the federal government. On Friday the U.S. Department of Justice filed a statement of interest arguing against the plaintiff’s claims that SB4 is unconstitutional. “The Department of Justice fully supports Texas’s effort and is participating in this lawsuit because of the strong federal interest in facilitating the state and local cooperation that is critical in enforcing our nation’s immigration laws,” stated Attorney General Jeff Sessions after the statement was filed Friday. The 49-page statement primarily argues that SB4 is not preempted by the supremacy clause, it is not inconsistent with the Tenth Amendment, and it does not violate the Fourth Amendment, which is the basis of the lawsuit filed in May by the League of United Latin American Citizens. The case originated as the City of El Cenizo v. Texas and is scheduled for a hearing Monday morning in San Antonio’s U.S. District Court. Since it was first filed El Paso, Dallas, Austin, and San Antonio, have joined the lawsuit filed against the state of Texas, Gov. Greg Abbott and Texas Attorney General Ken Paxton. During the NALEO conference, Latino leaders including Texas State Senator and Texas Senate Hispanic Caucus Chair Sylvia R. Garcia, D-Houston, spoke about the effect this law has already had on her community where there’s been a drop in violent crimes being reported. During a plenary session titled, Supporting the Lone Star State Post SB 4: How Latino Leaders Can Unite to Combat Anti-Immigrant Laws and Practices, officials shared the lessons they’ve learned from California’s Proposition 187 and Arizona’s SB 1070. Following the session, Adriana Cadena with the Reform Immigration for Texas Alliance, helped devise a plan of action which included boycotts, identifying allies, and educating the public about their rights. They said the boycotts needed to be targeted to the companies and supporters of legislators who supported the bill. Cadena said if stake holders and human rights advocates fail to stop SB4 other states could follow in passing similar legislation. She said the DOJ’s statement of interest was a way for the Trump Administration to show that they will back those who are willing to be their “foot soldiers,” in implementing his immigration policies. On Monday Cadena will be joined outside of the San Antonio Federal courthouse by immigrant rights groups from across the state including La Union Del Pueblo Entero, which intervened in the lawsuit to try and stop SB4. Inside attorneys from both sides will have their first opportunity to argue their cases before a judge.